We are BIG fans of BIG weight loss goals. Be sure to understand, though, that our definition of “big” is not necessarily some number value. It doesn’t matter whether your big goal is 15 pounds … or more like 50, 100 or even 200 pounds. If it is a big goal to you and is important to you, then it is important to us! 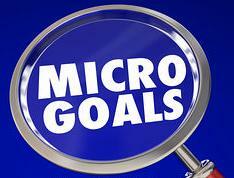 As important as “big” goals are, we routinely find that we must continually keep our clients focused on “MICRO” goals. These will prove to be critical to your weight loss and weight control success. So, what is a micro goal? Simply put, a micro goal is one small step along your road to success; Or a particular result you want to see as you are on your way to your big goal. A micro goal is not necessarily “small” or insignificant as the word may imply. And a micro goal is not necessarily even a number goal. It may simply be focused on an outcome you want to see during a specific time frame or through a particular event, challenge, situations, etc. There are varying reports coming from numerous studies about the average amount of weight gain Americans experience from Thanksgiving through the holidays up to and including their New Year celebrations. Those claims very from one pound up to eight or more pounds of average weight gain. It doesn’t matter which amount it really is. The reality is the end of the year IS a time of year that brings challenges to virtually everyone – whether they may be in a weight loss mode … or not! Clearly, there are more parties. More celebrations. More work events. More family functions. More food – especially more junk food. More snacks. More treats. More busy-ness. More distraction. For most Americans, more cold weather … meaning LESS fitness and activity for most. Oh, and that bad weather usually means more clothes … which means people become more able to creatively cover up those extra pounds that are trickling on! Sound Familiar? This is a lethal combination when one is attempting to lose and control their weight. So, this is exactly a time that MICRO goals ought to come into play! We have to adapt our mindset and focus. Although it is very important to think about that BIG, long-term goal, your ideal weight, your desired size, etc. etc. the reality is some key things need to be done today … in the present … “IF” we are going to ultimately get to that end goal. Sometimes, a person may get SO caught up in looking down the road that things slip right up and “bite” them in the rear! They take their eye off the NOW because they are only hoping, thinking and wishing for a better future. However, the truth is it’s those MICRO steps that allow them to STAY THE COURSE and actually end up where they ultimately want to be. People often minimize the seemingly “little” victories associated with making it through a dinner, a party, a day, a week, a season. Don’t let yourself do that! Set a goal for that party. What would be your “ideal” outcome? For that matter, what would be your bottom line “acceptable” outcome? How could you walk away or wake up the next day and feel good about how it went? The same goes for your day, your week or your holiday season. Winning even “small” victories - even though they may not be the “ultimate” win - provides us a sense of accomplishment. That stroke to the psyche and pleasurable sensation literally results in an internal change. Powerful and natural chemicals like dopamine are released. You feel good about YOU and this creates momentum! The point is you must choose to live consciously and think strategically in the moment and about the NOW in order to make your wishes, dreams and “big” goals come true. Keep it real simple. Chunk those challenging times down. Set MICRO goals so you are able to focus on what is right in front of you. Do not look past one small situation and allow it to steer you off course. You need NOT be “perfect”, but you do need to be awake, aware and in control. Remember, it’s all about Direction not Perfection! This chunked down way of living, dieting and creating a fresh, new healthier lifestyle is what WILL truly allow change to take place in your life … and in your weight. It really is a journey and a journey requires a step by step process. Or, as we are writing about here: a series of micro goal by micro goal being successfully achieved. To summarize, micro goals allow you to focus on what’s in front of you NOW … in order to fulfill that future you desire. It’s like winning “little” battles and, when you do that often enough, you ultimately win the “WAR” on your weight. Let us help you MICRO goal your way to that ideal and healthy weight you want! Click. Call. Or come in sometime soon!